This pattern will be efficient if there are ~5-10 EC2 Web/App servers in the infrastructure.If your web application layer has few hundreds of EC2 instances then Unicast TCP will be inefficient because of following reasons; there will lots of sync traffic data among Java Web/App EC2 instances and EC2 instances will be busy using considerable amount of their CPU cycles for synchronization rather than serving web requests and EC2 web/app memory will filled with redundant session data. 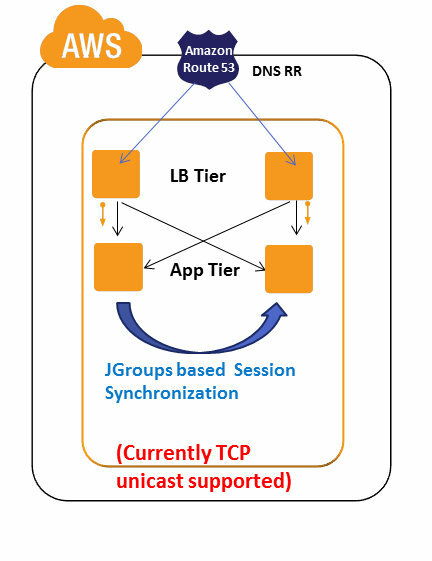 Note : vCider or VPNCubed seemed to support Multicast on AWS. vCider is acquired by Cisco and have stopped new downloads currently.